Appliance Standards and Labelling Regulations have been put in place. A key component of these regulations is that a number of appliances are now required to be labelled with a South African Energy Efficiency Label. The purpose of the South African Energy Efficiency Label is to ensure that consumers are informed about the relative energy efficiency of an appliance before they decide to purchase. The South African Energy Efficiency Label must therefore be visible on any appliances identified as requiring a label in both physical and online stores. 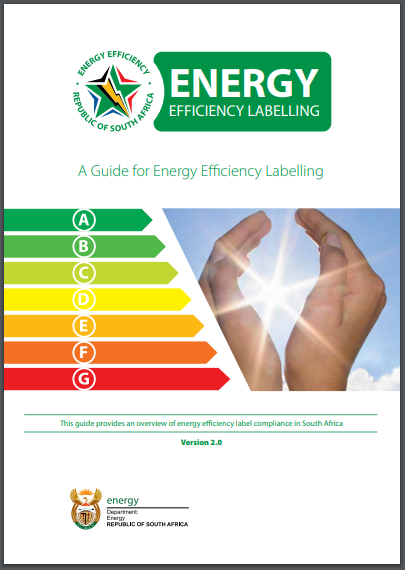 A detailed guide to energy efficiency labelling has been developed in order to understand the labelling requirements. The energy efficiency label has been designed to provide consumers with accurate and comparable information on the energy efficiency of household appliances. The information provided on the label indicates the energy efficiency class of the appliance, the manufacturer and appliance model. For some appliances, the label will also have non-energy data such as water consumption per cycle and appliance noise level. An example of a label for an electric oven is shown below. Labels for various categories of appliances differ depending on the functioning of the appliance, however, all labels include seven energy efficiency classes and the energy efficiency class of the particular appliance is labelled clearly.